Goodbye, my old friend, my favorite gardening shirt. I knew this day was coming. I could sense it when we last gardened together yesterday. I kept you safe, remember, by wearing a long-sleeve t-shirt over you. We had some good times, didn't we? Remember all the times we planted the vegetable garden in May? 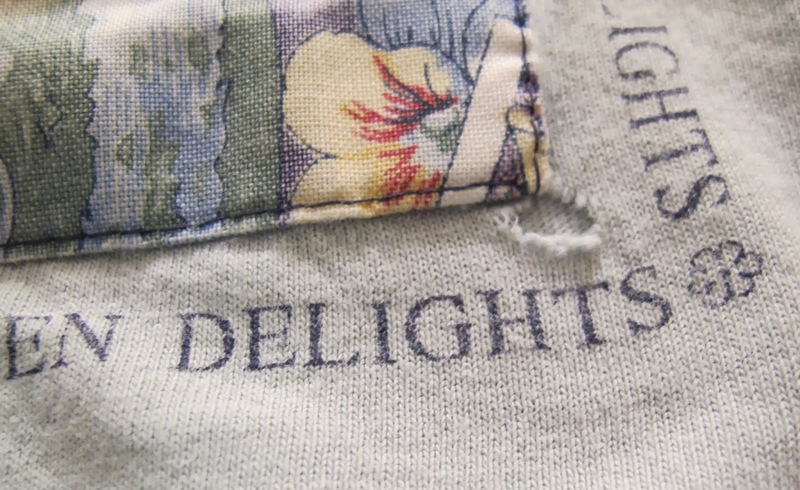 You were as delighted as I was to feel the sun on your soft fabric after months inside. I'll always appreciate, too, how willing you were to mow the lawn, even though I'd sweat and get you all wet. You were one of the best at keeping me cool. I can see how it has worn on you, though. Especially around the collar. Those holes on the shoulder seam. Oh gosh, do you remember how you'd make those holes on the shoulders look like bugs and then I'd swat at them? I'd laugh, you'd, well, you did whatever t-shirts do when they play tricks on their wearer. Lately, I've also noticed some stains on you that just won't go away. 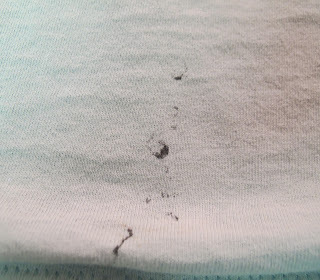 I think these stains come from that time you helped me unload mulch from the pick up truck. It seems that one corner of the tail gate always had some grease on it that would get all over you, but you never minded. But lately, more holes have shown up. I know you are just worn out. I understand. We had a good run, didn't we? How long has it been? I'm guessing maybe 15 years? That's a long time for a t-shirt. You should be proud. 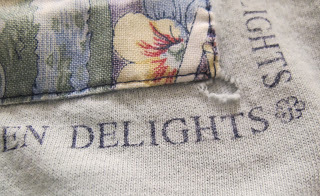 You were my delight, one of my all time favorites. Even though we won't go gardening together again, I'm going to keep you around. You deserve that. You don't deserve the rag drawer or worse, the trash. No, you deserve to be kept all clean, nicely folded, in a place where we can meet every so often, just to reminisce. And that's where I'll keep you, forever. Thank you from the bottom of my gardening shoes to the tip of my trowel for being a great gardening t-shirt. We all have a shirt or two like this. This post makes me smile. Have a great week. Wonderful post. Just wondering what you will replace your faithful gardening tee with? You can send it my way. It looks better than anything I garden in. awww... that was really cute. I loved the ending! I have some of my old faves stashed on a shelf in my closet. It is hard to totally discard shirts that have been so loyal and undemanding. I have a drawerfull of retired t-shirts. 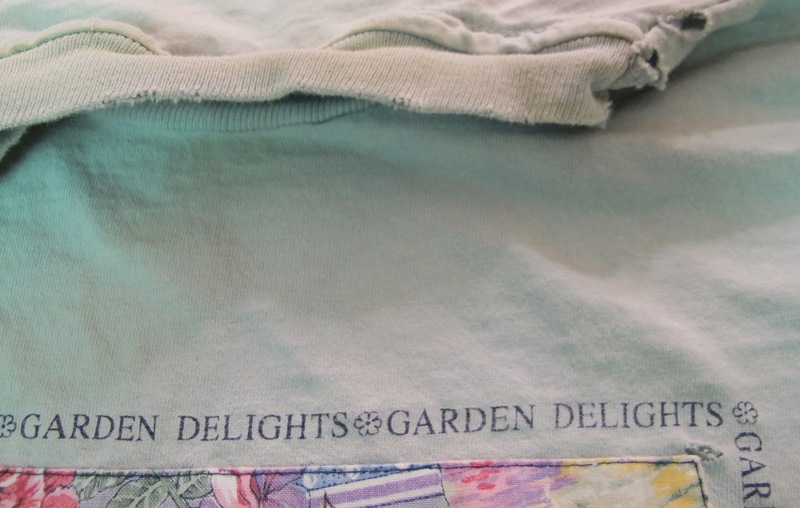 Ha ha, Carol, it looks like its still a perfectly good gardening shirt to me! 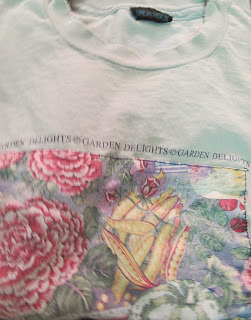 My favorite is a blue short sleeved shirt with big pink roses on it and a large rip on the backside where I caught it hopping over a chain link fence. I think I've had it for awhile since I haven't hopped over anything in quite a few years.
" Oh gosh, do you remember how you'd make those holes on the shoulders look like bugs and then I'd swat at them? I'd laugh, you'd, well, you did whatever t-shirts do when they play tricks on their wearer." I'm glad I'm not the only one who gets sentimentally attached to a piece of clothing. I'm also glad you are keeping it--sounds like the two of you made lots of memories together. Wait a minute, am I missing something here--is this shirt white, not green?? She does look good still, even in her old age. Not all gardening shirts are *about* gardening, so that makes her even better. May she enjoy her retirement! I've an old fleece heading in the same direction - although I'm not sure I have the same affection. My comfortable gardening shoes are another matter, I'll be gutted when they are finished. Rose, it's a light green t-shirt. The green didn't come thru very well in the pictures. But trust me, it is green. These shirts make the BEST recycled pillows for the sunroom!